If you’d like advice on what to buy but prefer to do your shopping from the comfort of your own home, my Online Shopping service could be just right for you. We’ll simply confirm what you are looking for, your budget and style preferences and I’ll set to work finding items that fit the bill! So that I can find you things in the colours and styles that suit you best, it’s helpful for me to meet you (in person or via Skype) or see photos of you first. 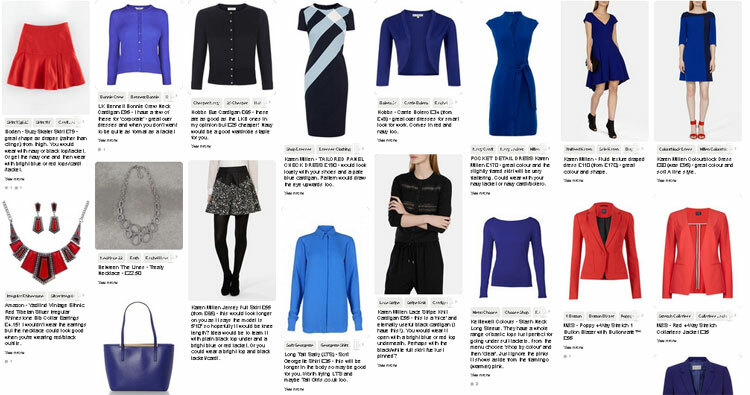 I can then create a Pinterest board full of ideas of clothes for you to choose from. To buy, you simply click on the item you like and you will be taken directly to the shop’s website. Within around an hour I can create a Pinterest board of a minimum of ten items. Click here to see an example board that I created for a client. £40 per hour.